What do you get when you mix a Chinese actor and artist with a Native American fashion designer? Well, we will have to wait a bit to see the full results, but here is a sneak peak. Native fashion designer Angela DeMontigny recently teamed up with Ayi Jihu for Jihu's project, Fear Chaser. Fear Chaser is the story of a woman who, after being hit by a comet, is able to see and combat her own fears and those of others. Fear Chaser fuses animation, art, video and photography with music and expression to explore relationships with fear through the eyes of Ayi Jihu. Jihu has been working with writers to create the Fear Chaser short story and movie, to be released this summer. 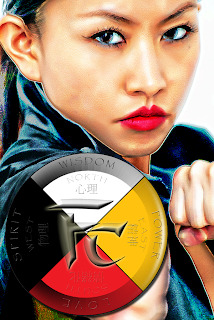 "The new Fear Chaser emblem is based on a Medicine Wheel and Native American concepts, teachings and ideas. Although to be fair several other cultures also have medicine wheels. It’s divided into four parts and each part represents something. The whole medicine wheel represents all the qualities, attributes and distinct abilities of mankind and combined we are whole. The Medicine Wheel used in Fear Chaser does not follow any distinct pattern. Each segment represents an animal, power, attribute and ability as well as a warrior from different parts of the world. I don’t want to give to much away but lets just say that as Fear Chaser she is able to tap into these abilities and attributes through her Medicine Wheel emblem. It’s really very cool and I learned so much studying medicine wheels and the different cultures that use them especially Native American cultures it was fascinating. Fear Chaser and her powers will be a combination of many different cultures from all over the world." "Wait till everyone sees the new Fear Chaser outfit, it’s amazing, so unique and so me really. Angela did so much work on this and it is just perfect. When I saw it, which was just recently. It was not what I expected it was completely different and I loved it. I won’t say too much about what it looks like now as I know Shlepp will be revealing it soon, but I can tell you it has strong Yi influences in its design as well as strong ethnic and Native American Indian influences. It is beyond cool... Working with Angela has been just amazing, because she just gets it. She is like me in many ways both of us are breaking new ground her as a Native American designer and me as a Chinese artist." It seems to me that this project is doomed to success. Fear Chaser is something new, but what people really need. Chinese actor and artist with a Native American fashion designer - this should be very interesting. I want to write an article on my english essay writing blog about this story.